We offer this intermediate class in two sessions. 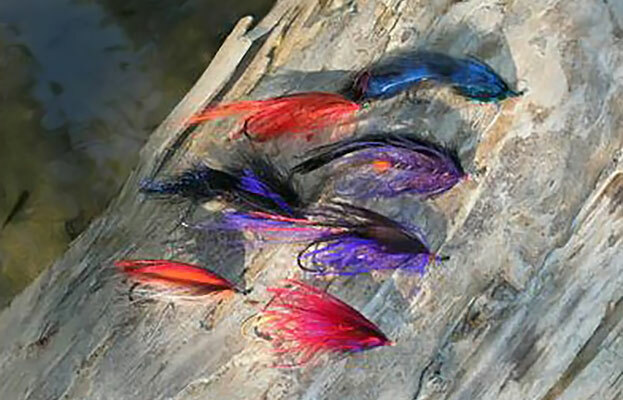 Various effective summer and winter steelhead flies that have been designed by the instructor will be included. An emphasis will be placed on tying with minimal thread wraps so that both simple and complex patterns can be tied without excessive bulk or crowding of materials. A discussion of fishing application will accompany each pattern. During the class, we will emphasize various dubbing techniques, winging styles and hackling. Some of the patterns included are the instructor's Skunks and unique skating dry flies. The second session will focus winter flies tied on tubes, shanks, trailers and all the deadly flies we swing for steelhead! We will also cover patterns requested by the participants as time allows. By the end of this class you will have an arsenal of skills to tie beautiful and effective steelhead patterns, as well as a better idea of how to fish them on the water. Materials (except for fly tying thread) will be provided, while the participants are expected to provide their own tools. Please call the shop at 206-362-4030 or email us to register.